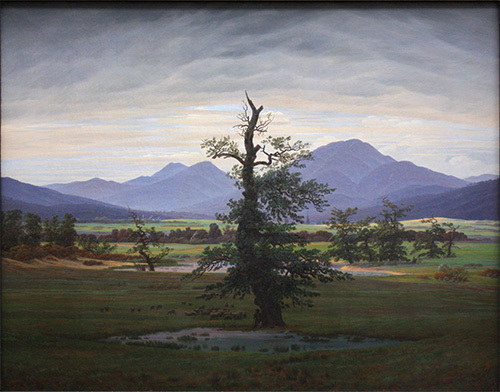 In a talk at Gage Academy in 2007, noted Seattle artist Margie Livingston mentioned that Caspar David Friedrich was a major influence on her work. Until then I confess I had never heard of him. Since then, I have heard claims of his influence on artists as disparate as Münch, Magritte, Richter, and Rothko, as well as playwright Samuel Beckett. When I visited Berlin this past fall I had to seek out his work and see it for myself. 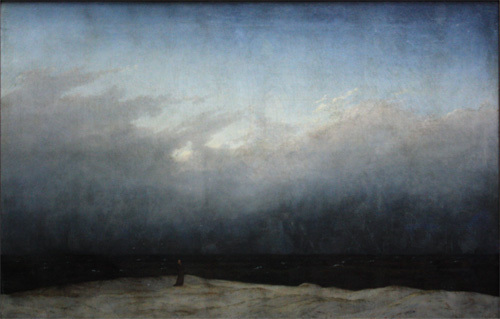 Although undistinguished by anything else but a very small Impressionist collection, Berlin’s Alte Nationalgalerie has a magnificent room full of Friedrich’s ouvre, including Monk by the Sea and The Abbey in the Oakwood. It’s clear why he has been so influential on so many later artists. These paintings from the early 19th century feel surprisingly modern. His sense of composition was exquisite, but often very spare, without the degree of detail and extraneous description that tends to look cluttered to modern eyes. Some pieces remind me of Japanese woodblock prints in their pared-down simplicity and sense of large expanses surrounding a few iconic figures such as humans, trees or ruined buildings. And although much of his work lends itself to allegorical readings, I also get the feeling that his paintings were based on keen observation rather than a set of conventional tropes. The colors are amazing: fresh and believable, with a great variety of palettes for different seasons, locales and times of day or night. The atmosphere is palpable, whether valley mists or crystalline mountain air. As a Northwest artist, perhaps I feel a particular affinity for his depictions of mountain landscapes in northern light and weather. 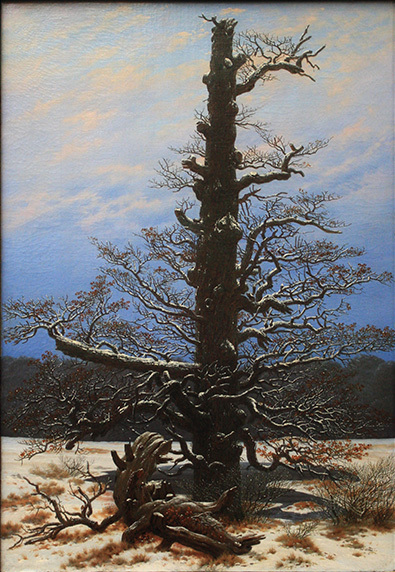 I’m now reading Werner Hofmann’s terrific Caspar David Friedrich (2000, Thames and Hudson). The copious illustrations are excellent, with good color accuracy and frequent detail illustrations. Overall the book is well organized and well written, and I recommend it as a wonderful reference on an artist who is drastically under-recognized in America. In November, a pair of exhibition spaces in Lincoln Nebraska, DRIFT STATION & Parallax Space, hosted a show called Instructions for Initial Conditions. The international open call invited fluxus-like scores, which were printed in black and white on letter-size paper and displayed en masse. “Initial condition” is a term used in Chaos Theory referring to a simple starting point that, when the system is set into motion, is radically transformed into an unpredictable result. The works in this exhibition describe an initial condition by which an artwork can be made or enacted, taking on the form of instructions that are exhibited as artworks in and of themselves. They run across traditions and disciplines: some act as a catalyst for acts meant to be carried out immediately, while others are purely poetic calling for no action, or are conceptual or impossible to be realized and can only be completed mentally. An exhibition catalog is now available for download (warning: large pdf file). I think it is well worth the large download: there are some wonderful, poetic works in the collection. 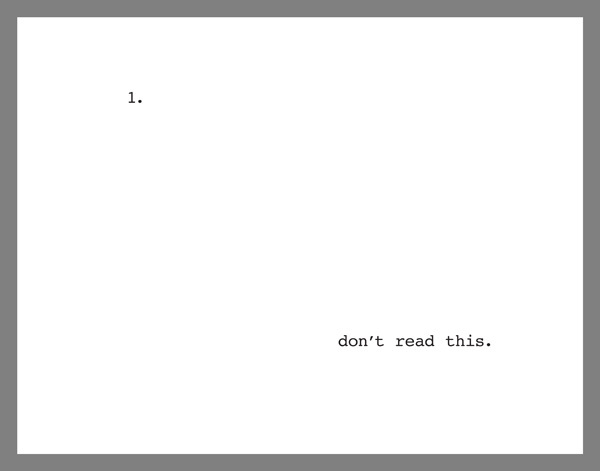 Those of you who know me will not be surprised that my entry was somewhere between tongue-in-cheek and contrarian.